I hate running, I hate stair-stepping, I hate skiing back and forth on elliptical machines. It's not just that I'm a power lifter at heart (although I am), it's that I find cardio so boring. I've tried everything--from listening to music, to watching Netflix, to fiddling with my Nintendo 3DS and rereading The Hunger Games on my iPad--to make cardio less boring. But because none of these distracting activities require that I actually perform cardiovascular exercise while doing them, my valiant efforts usually end with me slouched on the bike, reading instead of working out. 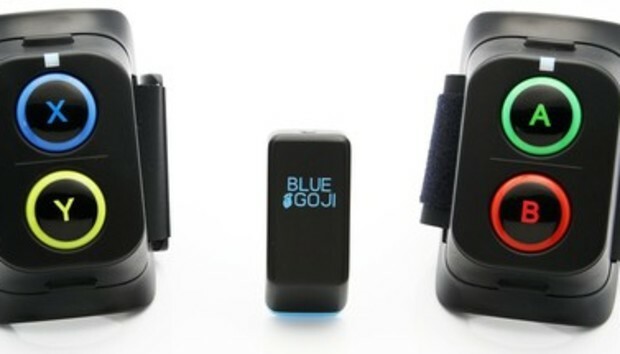 So trust me when I say that I could not wait to try out the latest in fitness tech: Blue Goji's Goji Play. Goji Play is the ultimate in cardio distraction--video games that require movement to play. For $99, you get (most of) the necessary equipment to set up a cardio game center, including two wireless game controllers, an activity tracker, and a slew of iOS games that will work with these peripherals. The only things you need to supply are a cardio machine (ellipticals, stationary bikes, and stair-steppers work best; treadmills are a tad tricky), a Bluetooth 4.0enabled iOS device running iOS 6.1 or higher, and your game face. The first time I tried to use Goji Play, I couldn't. In my excitement to get my cardio-gaming on, I'd forgotten a crucial component--the activity tracker--at home, charging on its Mini-USB cable. That's my fault, I know, but it highlights my first issue with Goji Play: It has too much going on. Goji Play is made up of many parts, tangible and intangible. In the box, you'll find two game controllers, an activity tracker, two foam batons, and a charging cable. The game controllers, which are powered by two AAA batteries each, will look familiar to veteran gamers--the left controller features large X and Y buttons, while the right controller has A and B buttons. The controllers have an adjustable strap that allows them to be attached to the handles of most cardio machines. If you don't want to attach the controllers to the handles of a machine (because you're on a treadmill, say), you can wrap the controllers around the supplied foam batons and hold them in your hands. The controllers have no power switches--just tap any of the buttons to turn them on. The plastic activity tracker is small and lightweight, about half the size of a box of matches. It has a light blue border and a clip to attach it to your clothes. It tracks activity only when it's connected to the Goji Play app, which means you can't use it as a stand-alone smart pedometer (boo). The app tracks steps, distance, and calories burned--standard activity tracker stats. The tracker is rechargeable via Mini-USB cable. Before your first session with Goji Play, you'll need to download the main Goji Play app and any games you want to play. The main Goji Play app keeps track of your stats; allows you to set goals, complete quests, and add friends via social networks; and serves as a launch pad for Goji Play games. However, all Goji Play games are separate downloads, perhaps to save your poor iPad's memory. Once you've sorted out all the peripherals and downloaded all the apps, you're ready to go! To the gym, that is, where you'll have to set up the entire thing--this includes attaching the game controllers to the cardio machine, clipping the activity tracker to your waistband, setting up your iPad/iPhone, plugging in your headphones, and making sure everything is synced up via Bluetooth. Oh, you'll also need to find a Wi-Fi connection; though some of the games appear to work without an Internet connection, the main Goji Play app does not. The second time I tried to use Goji Play, I remembered to bring all the pieces. After a few minutes of setup, I was ready to start playing the first game: Smash the Blocks. Smash the Blocks is a basic racing game--you're a pinball-type character rolling through a maze, and your goal is to free your ball-buddies and smash mean-looking blocks. To move in the game, you have to physically move, and the more intense your workout, the faster your character rolls. To move left, you press the Y button on the left controller; to move right, you press the B button on the right controller; to jump, you press both buttons together. This game is awesome, and a great fit for Goji Play. The two-minute levels are just long enough for interval training, and the simple objectives (free buddies, smash blocks, collect diamonds) are easy for an exhausted cardio-hater to complete (but not so easy that you'll lose interest). Plus, the upbeat music is invigorating. Unfortunately, Smash the Blocks may have set the bar a little too high. Most of the other games available for Goji Play are difficult and/or fail to make sufficient use of the activity tracker. For example, I found the free-runner game Spin or Die basically impossible--I couldn't stay alive for more than 20 seconds before being crushed by a bus or knocked over by a taxi. Other games, such as the knockout Fisticuffs and the Galaga-inspired Ralaga, use the activity tracker in different, uninspiring ways. In Fisticuffs, your movement determined the power of your punch--not a bad concept, but it totally did not inspire me to move faster. In Ralaga, moving faster supposedly meant higher-powered lasers (I couldn't tell the difference). In my opinion, Goji Play is best used with racing games, where you can actually see the difference your movement is making. But at least there's something for everyone. I really, really wanted to love Goji Play. As a concept, it's awesome. But in practice...let's just say it needs some work. At the moment, Goji Play feels as if it's still in production. It has many parts, and they seem disjointed--the controllers have no power buttons, but the activity tracker does; the controllers take AAA batteries, while the activity tracker is rechargeable; the Bluetooth connection is shaky, and sometimes the activity tracker won't connect to your iOS device without an Internet connection. The apps are also disjointed--each game has a different feel, and while the main Goji Play app tries to tie them together, getting back to that app can be difficult thanks to occasional Bluetooth drops and difficult controls (to get to the main menu, you press all four buttons on the controllers...but that doesn't always work). For $99, I expect a smoother overall process. While most of the games could use some work, I really enjoyed Smash the Blocks. In fact, if Smash the Blocks was the only game on Goji Play, that would be fine (though, again, I don't think I'd drop $99 for it). The other games had me heading outside the Goji Play sphere to surf the Web and play Zookeeper Battle. But the company says it will continue to work with third-party developers to release more games after launch, including premium paid titles. I still hate cardio, but I hate it a little less with Goji Play. And I'll hate it even less if Blue Goji comes out with a smoother, less buggy Goji Play 2.0 in the near future.